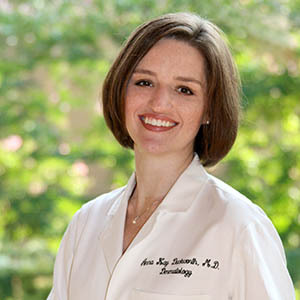 Dr. Anna Kay Duckworth is a native of Augusta and founded Savannah River Dermatology in 2008. She received her undergraduate degree from the University of Georgia and attended medical school at the Medical College of Georgia. Thereafter, she remained in Augusta to complete her medicine internship and three-year residency in dermatology serving as chief resident during her final year, 2008. She is a member of the American Academy of Dermatology, Georgia Society of Dermatology and Dermatologic Surgery, Columbia County Chamber of Commerce, and is currently serving as President of the Augusta Dermatology Society. She enjoys reading, traveling, and spending time with her family. She is married to Patrick Duckworth and they have three children, Ella Reyn, Jennings, and Gresham. Our staff is always here to help find a time that works for your busy schedule.